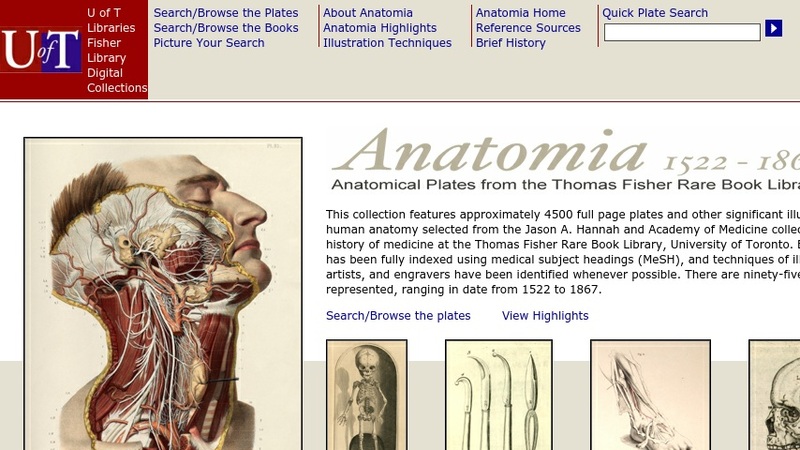 Developed by the University of Toronto Libraries, the Anatomia website offers a collection of about 4,500 plates and images of human anatomy from the Thomas Fisher Rare Book Library ranging in date from 1522 to 1867. Visitors can search the plates by entire plate description, artist, subject words, and/or plate title or can browse the plates by artist, title, or subject. By selecting the Anatomia highlights link, users can view images of importance due to their contributions to the advancement of knowledge, educational value, or artistic value. Students can discover the three processes of creating illustrations during the sixteenth to the nineteenth centuries: relief, intaglio, and planographic. The website supplies a concise history of the study of anatomy.